Six new beds and one birthing bed have been added to the sim lab thanks to a generous donation to the NIU School of Nursing. The nursing simulation laboratory received several upgrades this summer. The lab replaced an obsolete medicine dispensary machine with a current, state-of-the-art version, called the Pyxis MedStation. This device will not only help nursing students better understand medication safety and efficiency, but it is also the same machine used by many hospitals today, making this hands-on experience directly applicable to potential future job requirements. Another addition to the simulation lab was the purchase of six new hospital beds and one birthing bed, with bedside tables. 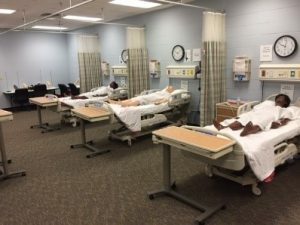 One goal of the simulation lab is provide realistic conditions for the nursing students to practice problem-solving within the scope of the nursing profession. The addition of new beds, again similar to those used in hospitals today, helps achieve that. The beds play host several high-fidelity mannequins, to include the one the School of Nursing Class of 1965 recently purchased for the lab. Lastly, the simulation lab added two high-tech diagnostic aids to their inventory with the OtoSim and OpthoSim devices. These devices simulate the examination of a patient’s ears and eyes with hundreds of high-definition photos of actual ear and eye conditions, challenging the student to identify and recommend treatment. These upgrades were made possible thanks to the generous donations of Patti and Rich Hartley.